multi pattern and voices is really intuitive. congrates! actually easier for me than original firmware. 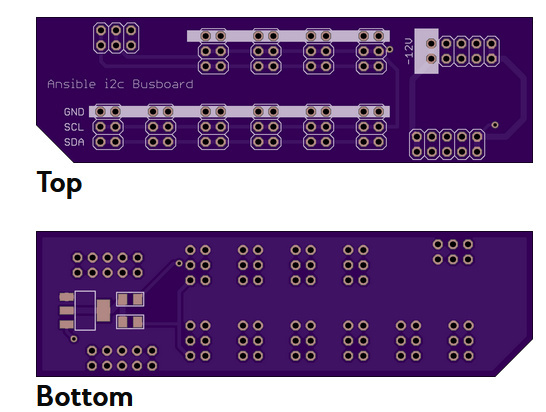 would love to try out i2c if you get around that extra button position for JF/i2C 64. Super Noob question, where are the firmware files posted? i had to remove them temporarily and wasn’t able to restore from the old post. i’ll post new files when i have a new version ready. Ah great, thought I was blind, tried looking everywhere! Been trying out Ansible Earthsea and can already imagine the improvements in the PolyES version, looking forward to your update! midi support for now is just playing live, and any cc value is mapped to mod bus 1. i’ll be adding midi learn in the next beta. Contribute to james-everitt/ansible-i2c-busboard development by creating an account on GitHub. Wonderful work! Will you be planning on adding a midi record function? yes, midi recording and midi learn function (to assign CCs to mod buses) is planned for next version. Have finally installed this and enjoying it a lot! Wondering though is there is an issue with the preset button, cos when I press it on the front panel of Ansible, nothing happens, neither with short or long press. The LED doesn’t light up neither to indicate current pattern start, it doesn’t light up at all on mine. thanks, looks like a bug was introduced in the latest change that broke the front panel button functionality in ansible. i’ve posted a new beta for ansible that should fix that. also confirmed the LED is working - please note it’s for the current pattern only, so if the pattern you’re currently on is stopped it will do nothing. Thanks, will try it tomorrow and will not the led light too! Just installed your last version and checked. Presets work, the LED light works BUT not when receiving external clock. ah i know what the problem is, will fix in next update! this will also affect pattern start events assigned to any outputs or mod buses. Is there a way to record longer presses when using an external clock? I don’t know if I like what happens to the pattern when synced externally cos it loses its ‘swing’ somehow. Would there be a way to extract the clock from poly-es to use to clock other modules? And is there a way to sync the second, third, forth pattern to the Master pattern during recording? with external clock connected it just follows that (a new note or chord is played whenever a trigger is received). preserving your timing at the same time is not possible. something could be implemented but then it’s a much bigger feature with a lot of questions - how would your original timing work in this case, would it preserve the relationship to the clock somehow? or time stretch? etc etc. one thing you could do if you’re using ansible - the 2nd gate input works as a pattern reset. so you could use your ext clock to just trigger/reset your pattern which will keep its original timing. you can also enter rests - when recording press the top right button. re: extracting the clock - you can route each note start (or pattern start) to any gate output. see this page for details (i’ll do a video soon too). is there a way to sync the second, third, forth pattern to the Master pattern during recording? you can only use the leader pattern to reset playback of other currently playing patterns. you can’t use it to sync during recording. what you could do is start playback of your leader pattern, then switch to the one you want to record, arm recording, then wait for the leader to start and record whatever you want, and wait for the leader pattern to finish, then stop recording. now your recorded pattern is slightly longer than the leader one, so you could play it and have the leader restart it. hope this makes sense! The updates with MIDI connectivity are great — it really expands the possibilities of all the various modules! I’ve had success connecting some different USB MIDI keyboards and sequencers like my OP-Z, and having these features or something similar would help out a lot. would it be possible to have a mode where MIDI channels could correspond to a particular CV/gate? likely not - the MIDI implementation here is not meant as a MIDI-to-CV function but rather as part of polyearthsea itself, so it has to use the existing mechanism for voice allocation. i could consider adding a way to enable something where each MIDI channel corresponds to a pattern and uses whatever voices are assigned to that pattern. could you describe the use case you had in mind in more details? noticed that too, will fix in the next version. Does this version work without i2c, just Ansibe? you only need to use i2c if you are planning to connect it to er-301 or just friends or telexo. if you just want to use the cv and gate outputs on ansible you don’t need it. i could consider adding a way to enable something where each MIDI channel corresponds to a pattern and uses whatever voices are assigned to that pattern. could you describe the use case you had in mind in more details? Having different voice allocation possibilities per pattern seems like it would make things more complex, but I think it would be really interesting addition to an already game-changing firmware! My specific use case is to use an OP-Z where I can assign particular tracks (mono or 2-4 voice poly depending on track settings in the OP-Z) to separate MIDI channels with a mixture of sequenced material on some tracks, and live input and/or mangling of sequenced material on the active track. Right now it seems like polyearthsea reads MIDI from all channels and assigns them as a combined whole, but it would be great if MIDI channels could be allocated separately somehow. That way I could have more control over how material gets routed when using MIDI instead of the grid. My guess is that this might mean: multiple patterns would need to be able to receive MIDI data at the same time, and there would also need to be the possibility for different patterns with different voice allocations, either setup beforehand by the grid or be automatically assigned when a MIDI device is connected…? another mode will send MIDI notes from channel 1 to pattern 1, MIDI notes from channel 2 to pattern 2 etc. then you would need to set up your patterns so that pattern 1 only uses voice 1, pattern 2 only uses voice 2 etc, and map your voices so that voice 1 is mapped to output 1, voice 2 mapped to output 2 etc. adding the ability to freely map MIDI channels to voices i’m afraid wouldn’t be feasible - it would complicate the UI further (and i already heard comments it’s very complex as is). this really sounds like a job for some standalone MIDI to CV firmware. edit: btw there is a bug right now where MIDI will use all voices available, not just the ones the current pattern uses, i’ll fix this in the next version.